We Build Community 2013-2014, will focus on and support NCSO members to more effectively deepen their capacity and involvement in alliances and coalitions that connect South Asian American communities with broader movements for racial justice, immigration justice, gender justice, and/or LGBTQ justice. Congratulations to the 2013-2014 We Build Community cohort! Chhaya CDC is working to develop the communications strategy for an affordable housing campaign. The campaign advocates for the adoption of an accessory dwelling unit (ADU) code that would bring safe basement apartment units in New York City up to code. The campaign aims to address multiple challenges faced by low-to-moderate income New Yorkers (in particular immigrants) including tenant displacement, foreclosure, and rising costs of rent, as well as the severe financial penalties for homeowners with informal basement units.The specific capacity-building need to be addressed here is the campaign’s communications strategy, structure and mechanics. DRUM’s program project is to better publicize DRUM’s model and messaging on key racial justice campaigns and seed community organizing to scale nationally across Arab, Middle Eastern, Muslim, and South Asian (AMEMSA) populations for racial, economic, and social justice. The outcome DRUM seeks is to build the racial justice movement in AMEMSA communities and the critical mass needed to win local and national End Racial Profiling campaigns, legalization without more enforcement, and ending criminalization of youth. Specifically, they will expand and amplify communications of their campaigns, and continue their assistance in the investigation of NYPD’s Stop-and-Frisk policies through their End Racial Profiling Campaign CSA Implementation. DRUM is working to expand its current capacity to sustain and grow the number operational staff so that lead staff can focus on the responsibilities of running local and national racial justice and immigrant justice campaigns. SAAPRI will expand its ongoing story collection related to immigrant reform/integration and health care access to incorporate issues related to gender justice and LGBTQ justice. SAAPRI plans to collect stories related to gender justice and LGBTQ justice to be part of broader story collection campaigns already in progress (related to immigration and health care access), in order to highlight the similarity of all human experiences and not portray women’s issues or LGBTQ issues as being unrelated to all of the community’s stories. 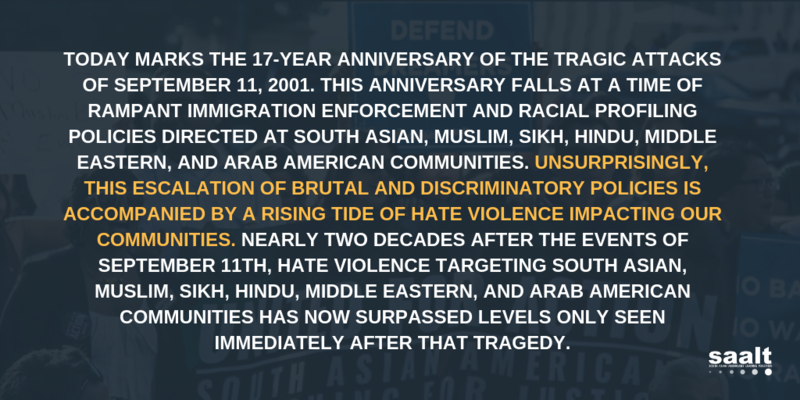 The goal of this approach is to help acclimate the South Asian American community to LGBTQ and gender justice issues and underscore the point that these are not issues that matter only to people of a particular generation or political ideology.SAAPRI hopes to continue establishing an advisory board and developing that board to better support and grow the organization and its work. SAPNA NYC plans to conduct trainings that will build South Asian immigrant parent capacity so that they can successfully campaign for language access and cultural accommodation for immigrant children and their families. The goal is to create a space where new parents can come together, gain access to crucial information and resources that will better their children’s education, and catalyze local parent involvement in the Bronx so that they can become leaders and advocates as New York City parents.Concerning capacity, SAPNA NYC is seeking to provide their Director of Advocacy and Outreach the opportunity to develop skills and capacities surrounding immigration coalition building and leadership training. This, combined with the capacity to develop an internship placement will help SAPNA NYC increase its data collection and documentation efforts. The Sikh Coalition is striving to expand the trainings it provides to students in order to help students teach their peers about diversity, which they would be able to deliver in their own schools and to youth groups in their neighborhoods. The trainings would include diversity education on Sikhs and Sikh practices to non-Sikh youth and build relationships with non-Sikh community youth groups and student clubs in schools. The organization would also like to coordinate with youth groups in New York City who are already working on anti-bullying initiatives in order to link each organization’s individual anti-bullying efforts. 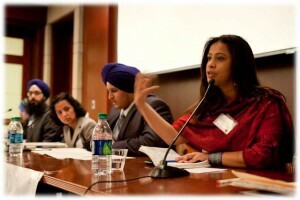 Combined, all of the organizations would like to host a youth-led City Advocacy Day (CAD) in order to influence NYC elected officials to support our collective anti-bullying efforts.In order to increase the organization’s overall capacity by enabling students to deliver these trainings in their local communities, the Sikh Coalition will utilize the following resources: programmatic staff time, expertise of third-party consultants and training materials and resources.